Back in 2012, Travis Bayer and Eric Davidson weren’t focused on crops. Bayer was teaching biochemistry at the University of Oxford. Davidson was a research associate for the Center of Synthetic Biology at the Imperial College in London. But that spring, the U.K.’s Environment Agency issued a dire warning. More than half of Britain was in drought—the country’s most severe water shortage since 1976. “It was a big problem, an important problem, and we thought that as biochemists, we could bring a unique perspective,” Davidson says. Environmental pressures like drought confront growers across the globe, and they can exacerbate the many other demands growers face. The challenges are intertwined, coming from every direction, including profitability requirements, food-supply-chain demands and nutrient shortages. “For better or worse, growers are going to have to evolve how they deal with those pressures,” says Derek Norman, who heads up Syngenta Ventures, one of the world’s first venture capital groups dedicated to agriculture. Since he joined Syngenta Ventures in 2009 as one of its founding members, Norman and his team have committed to identifying entrepreneurs, like Davidson and Bayer, who are developing new tools growers can use to battle these pressures. By nurturing #ag startups, @SyngentaUS Ventures is helping to foster improved practices in the coming decade. When members of the research and development (R&D) group at Syngenta first identified Sound Agriculture as a promising new startup, both they and the Syngenta Ventures team immediately recognized the potential for a strategic partnership. Today, Sound Agriculture is one of more than 15 companies in Syngenta Ventures’ portfolio. 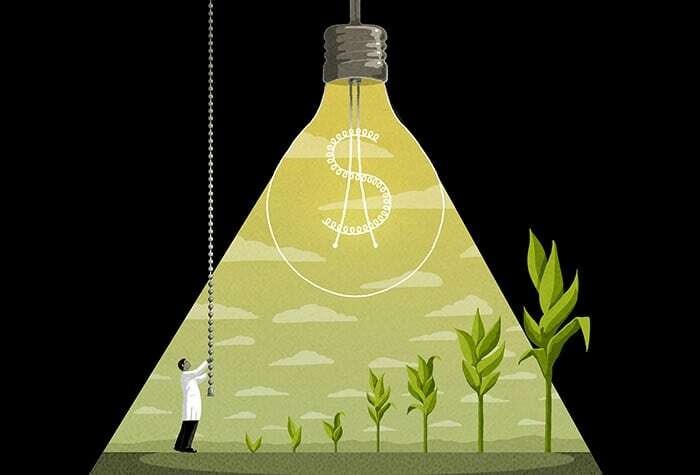 There’s no one-size-fits-all formula for the ideal Syngenta Ventures investment. It’s more about casting a broad net and finding companies that share its vision for making growers’ farms more sustainable and more profitable. That means Syngenta Ventures team members participate in board meetings, help steer strategy and business development, share Syngenta resources, and help the companies expand their professional networks, which is useful for recruiting talent. Take AgriMetis, a Syngenta Ventures’ portfolio company that develops natural products to protect crops from weeds, diseases and insects, as an example. “The Syngenta R&D group helped AgriMetis develop its testing capabilities,” Norman says. Finally, Norman says that a good venture capital team must be savvy enough to make commitments and decisions that play over a long time period, often more than five years. Making good decisions today requires understanding future challenges. “In the last 10 years, the whole ag-technology sector has changed and blossomed before our eyes,” he says. Satellite imagery and drones, for example, felt like the stuff of sci-fi novels when Syngenta Ventures was founded, but now they’re common sights in ag offices and fields across the world. One portfolio company, Phytech, draws on spatial imaging, hyperlocal climate information and agronomic modeling to help farmers improve their profitability.